We had known for a couple of days that dinner on Christmas eve was going to be a significant ship-board event. A few of us hatched a plan to make it even more Christmassy and special by lining up some carolling and singing. We thought Silent Night might be widely enough known to be able to have a verse sung in as many languages as possible, although there was much chopping and changing of how many people actually knew enough words to be prepared to sing in public. 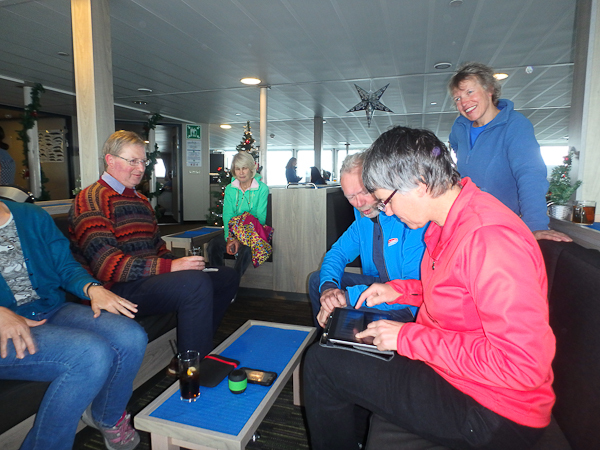 Here’s a group of us testing out the iPad piano to determine its uselessness as a public performance instrument. 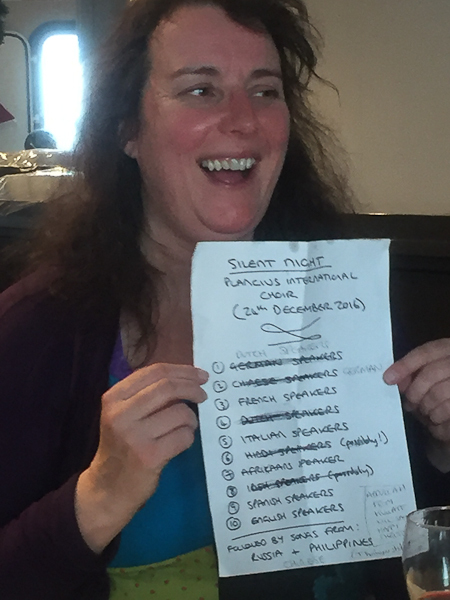 This is Declan, who was one of the chief organisers of the great Plancius Christmas song-fest, with the much altered running sheet. In addition to the verses of Silent Night (and we really were going to have a Chinese version; I heard it during the afternoon, but there was a change of mind), a number of language groups did a song of their own. The dining room had been decorated, and I had even remembered to pack a Christmas hat, just in case. I’m not sure why there’s such a lean in the photo below (there were calm seas, and it was still quite early in the night! ), but that’s me in the hat, with Declan’s partner Carl on my right, and my sister Catherine on his other side (and I can’t remember the name of the guy on the left). 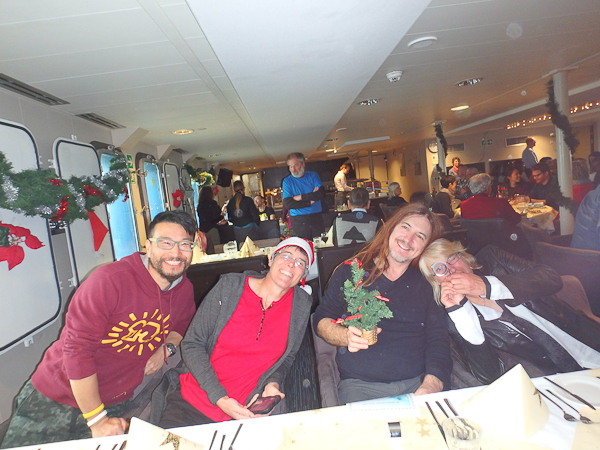 The menu was fantastic (the food on the whole trip was amazing), and we had a wonderful meal with lots of conviviality. 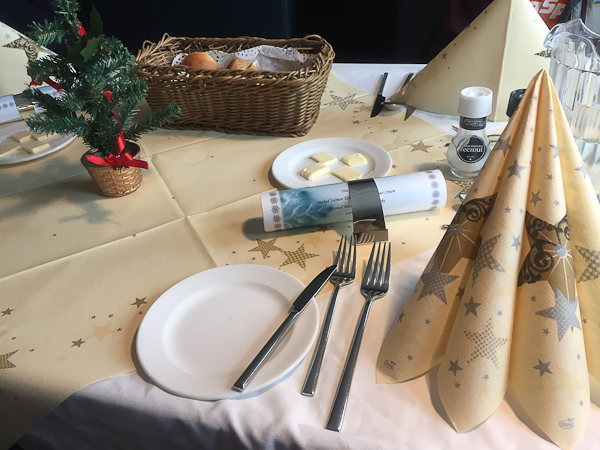 The metal “napkin rings” (which were not rings, and which enclosed the menu rather than a napkin) were engraved with “MV Plancius 2016 Christmas Expedition” and we were able to keep them as souvenirs. Between the main and dessert courses there was an uplifting — if slightly crazy — atmosphere as everyone got into the spirit of the singing and entertaining. In the photo below (which Declan or Carl took) I’m the red hat at the far left, and in the centre against the far wall there’s one of the cultural/language groups singing something. It was a memorable evening, and a rather unique way and place to celebrate Christmas eve.